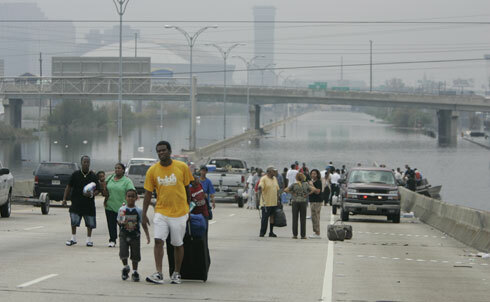 Editor’s note: To mark the sixth anniversary of Hurricane Katrina, we are presenting once again this slide show of images and recollections, first published on August 26, 2010. 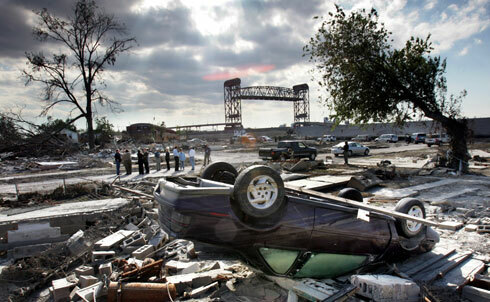 Five years ago, Hurricane Katrina slammed into the Gulf coast, ravaging communities from Louisiana to Florida. 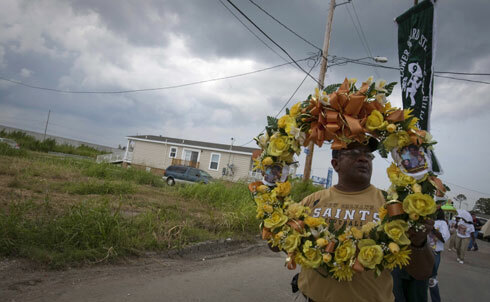 But hardest hit was New Orleans, where the hurricane’s legacy of destruction remains most powerful today. "We’re still coming to terms with what happened in New Orleans on August 29, 2005, and there-after," writes Rebecca Solnit in her Nation article "Reconstructing the Story of the Storm," "struggling to get the facts straight and to figure out what it said about race, disaster and even human nature. How we remember Hurricane Katrina is also how we’ll prepare for future disasters, so getting the story right matters for survival as well as for justice and history." Solnit’s writing has attempted to recast the narrative of post-Katrina New Orleans, giving voice to those whose lives will forever be altered by neglect, brutality and lies. We excerpt and illustrate her recent Nation article in the slides that follow. The story of Hurricane Katrina as originally constructed served authoritarianism, racism and a generally grim view of human nature. The gist of the media’s stories was that in the absence of authority, people went berserk; the implied solution was the reimposition of authority—armed, ruthless and intense. Heavily armed Blackwater mercenaries were dispatched to New Orleans, where, as Jeremy Scahill reported in this magazine, they shot at citizens with little fear of repercussion. While the focus was on young men of color as the peril, police and white vigilantes went on a murder spree that was glossed over at the time. New Orleans became a prison city; the trapped citizens became prisoners without rights. Those in the Superdome, for example, were prevented from leaving the stinking, scorching zone as people dropped from heat and dehydration. The literal prisoners, adult and juvenile, in the New Orleans jails were abandoned to thirst, hunger and rising floodwaters. Hospitals packed with the dying were not allowed to evacuate; citizens were not allowed to walk out of New Orleans on the bridge to Gretna because the sheriff on the other side was there with cronies and guns, keeping them out. Real people got caught in the crossfire. Take 33-year-old Donnell Herrington, who was walking to the evacuation site in Algiers Point when a white vigilante with a shotgun attempted to murder him. Herrington was shot in the neck, hit so hard the blast lifted him off the ground, and then shot again in the back as he tried to escape. His assailants were part of an organized militia that presumed any and all black men were looters and decided that they were justified in administering the ad hoc death penalty for suspected or potential petty theft. No one reported on these vigilante crimes in the first round of coverage. 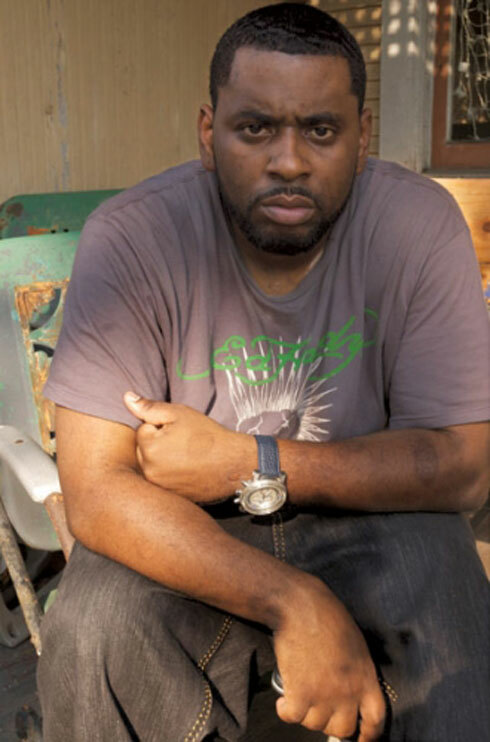 Or take Henry Glover, a 31-year-old father of four whose charred remains were found in a burned shell of a car a week after the storm. A.C. Thompson first reported on the mysterious circumstances surrounding Glover’s death in his Nation article "Body of Evidence." 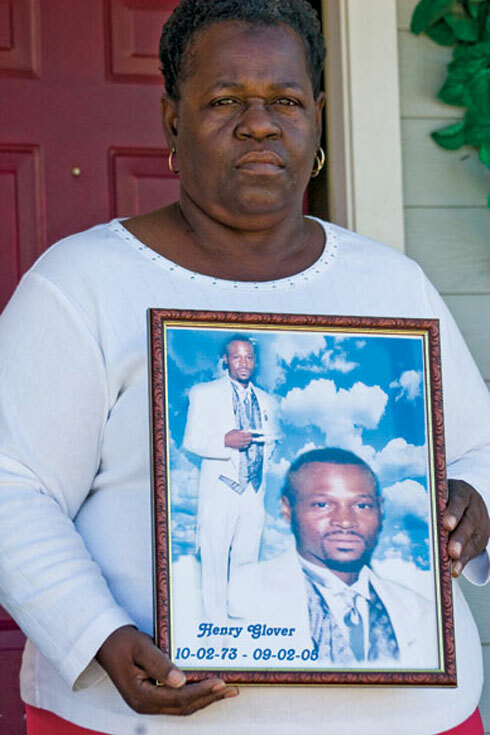 Thompson also joined forces with Times-Picayune reporter Laura Maggi, who reopened the Danziger Bridge case, in which police shot several unarmed African-Americans after the storm, including a middle-aged mother who had her forearm blown off, a mentally disabled man who was shot in the back and killed, and a teenage boy, also killed (several others were wounded). 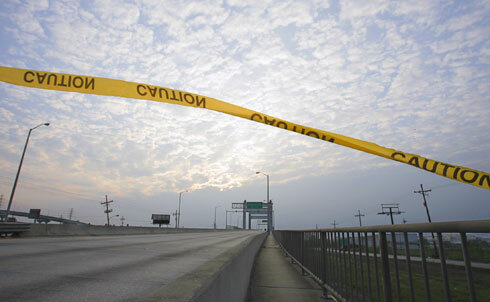 Justice Department officials have charged eleven policemen for the Danziger Bridge case and five for the Glover case, and most recently sent warning letters to two more for the post-Katrina case in which Danny Brumfield was shot in the back and killed. In total they’ve opened up six civil rights cases for New Orleans police crimes post-Katrina, and a federal probe of the department is under way. Then there’s the catastrophe’s impact on national politics. The Bush administration’s outrageous incompetence and indifference prompted a hitherto intimidated press and nation to begin criticizing not just the failed response but the Iraq War and the administration overall. The levees broke and so did the bulwarks that protected the president. 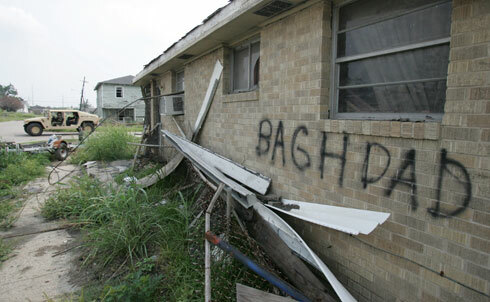 The racism and poverty that the catastrophe revealed laid the groundwork for newcomer Barack Obama to ride to victory in 2008. 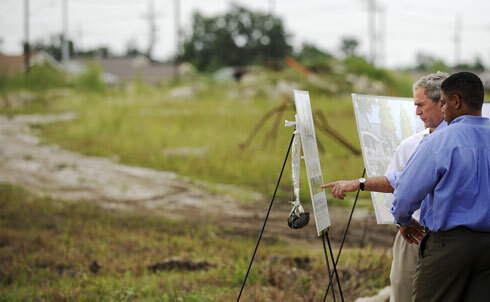 Katrina brought many kinds of destruction and a little rebirth, including the spread of green construction projects, new community organizations and perhaps soon, thanks to the work of Thompson and others, some long overdue justice for police crimes. It’s too soon to tell what it will all mean in a hundred years, but it’s high time to start telling the real story of what happened in those terrible first days and weeks.